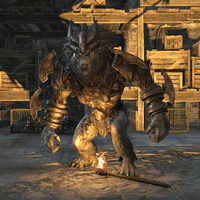 Ironfang is a giant troll found in Garlas Agea (map). It was smuggled out of Craglorn by the Gold Coast Trading Company and has somehow escaped from its cage, posing a risk to the entirety of the Gold Coast. It serves as the delve's boss and must be killed to clear the location. Ironfang has a chance to drop the following chapters of the Assassins League style: Shields, Shoulders, Staves. The Common Good: Kill a dangerous beast which has been smuggled to the Gold Coast from Craglorn. This page was last modified on 12 June 2018, at 04:19.